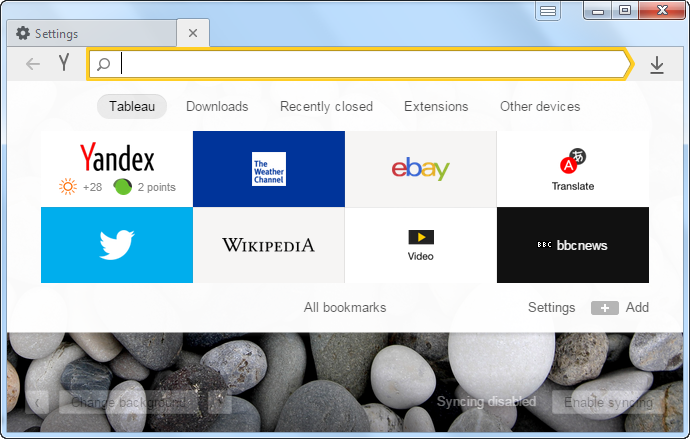 Yandex.Browser is a fast and simple program for browsing the internet. Yandex.Browser only takes a couple of seconds to launch. The browser interface is limited to just the most necessary buttons, with plenty of space for viewing pages. When you open a new tab, you see the Tableau — a panel with widgets for your favorite pages. To go to one of the pages, just click the widget. Some site widgets display current information (for example, weather or traffic, or social network notifications). In the SmartBox, you can enter either website addresses or search queries. The suggestions help you refine your search. 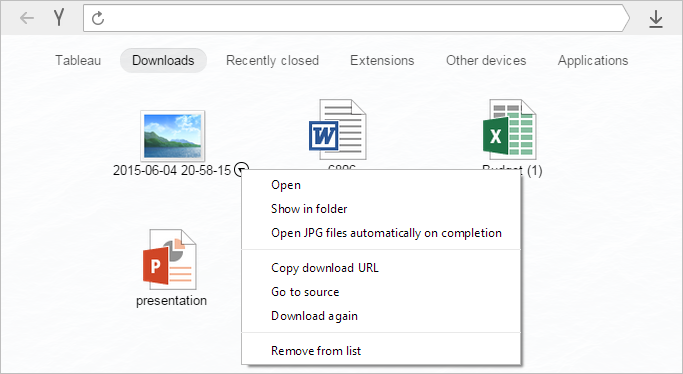 Searchness mode lets you use your favorite search engine in the SmartBox. When visiting certain websites (such as online stores), the browser shows you quick links to the main sections of the site. Yandex Safe Browsing technology protects your computer from infected pages. Yandex.Browser warns you of danger if you go to a website associated with SMS fraud. All the files you download are scanned for viruses. Every file is checked against a list from Yandex. 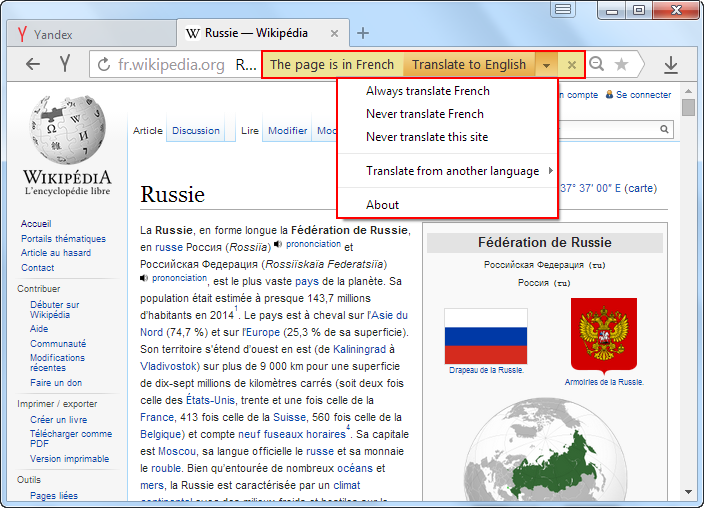 Yandex.Browser can translate foreign website pages to your native language. It recognizes 33 languages, including English, German, French, and Ukrainian. If you find an unfamiliar foreign word, place the cursor over it and hold down the Shift key — the browser will translate it for you. Syncing provides reliable storage of your browser's settings on a special Yandex server. Your bookmarks and Tableau will be available on any computer, smartphone, or tablet and won't be lost, even if your device fails. 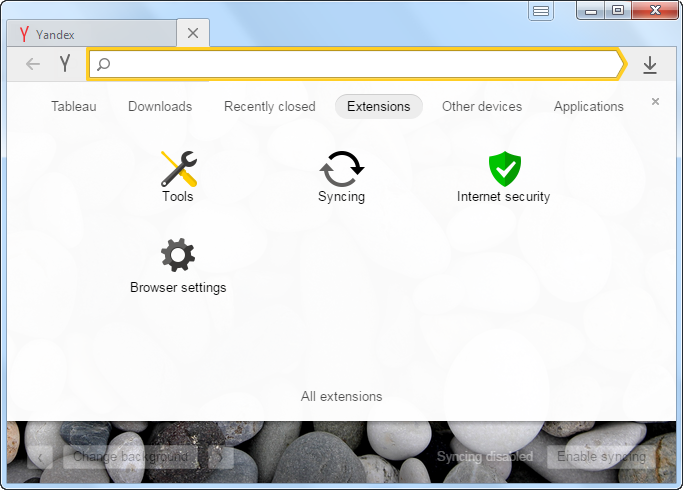 Yandex.Browser can also import your bookmarks, browsing history, and other settings from another browser that is installed on your computer. 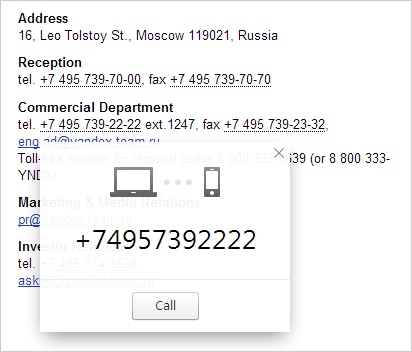 If your Yandex.Browsers are synced on your computer and your smartphone, you don't have to dial numbers on your phone in order to call numbers shown on websites. Click a phone number in your computer browser, and your smartphone will dial it.